Client has nation wide operations in the business of Titles and Escrow activities of Real Estate Industry. The client has large collection of data, which they needed to be presented, charted and graphed in a synchronized manner so that the business users can comprehend the business activities going on in the organization. They should be able to understand the trends of the past and anticipate the trends to take appropriate business decisions. The data and information was needed to be presented both based on geography as well as on the basis of organizational structure. STPL has had experience of working on software applications in the business of real estate. The technical team deployed was already familiar with the language of the business and client got the head start in interacting with the team and communicating the needs. Client was also looking for an IT services organization with ability to plan-build-manage the solution. STPL fit in the role and provided services for all the three phases of the application life cycle. The prime business need was to manage the massive databases located in different regions and present the information from the centralized data storage, the application provides performance graphs over a span of time, projected values on the basis of different levels (national, region, state, county, territory) etc. The management needed an application that could provide better view of their transactions, revenues generated and the projected values. As the data base is distributed over various data storages, the need for an application that would synchronize and manage the data was an essential requirement. As the business of the client is distributed all across USA, the client required that the application should help the management to drill down to the transaction level. The data was also to be presented in such a manner so that analyzing performance at lower level is easier. Information was to be used for decision making hence the accuracy of information being reported is critical. Data migration technique using SQL Server Services were used. Performance and Security Issues were to be balanced. Easy to navigate through the site and see the performance at the different levels. This module represents information in the mode of KPI (Key Performance Indicator). STPL analyzed the Real Estate business and proposed the few key factors that helped in taking quick decisions. The summary module page contains information for orders, revenue. The module represent comparison between different time period, status in current time frame, projected information for order or revenue against different levels like national, region, state, county, territory and thus multi dimension report were created. This is the one of the major part of the National Dashboard application. The order module divided in different sub-groups like open orders, closed orders, open vs. closed orders, last year vs. this year. The revenue module covers the sub-groups like revenue trends, last year vs. this year. The pages represent the data in the mode of graphs and tables. Having the KPIs in sub-groups helped the user to quickly see the important data. The flag feature is incorporated in the KPIs. It helps user to easily visualize the comparison against last month, last year even for last working day. The MDR has its own way of representing data. The information is presented in the tabular format. The multiple dimension reports are divided two major sections "Order", "Revenue". The reports are available at different level like territory, county and regions. The application has number of graphs to display information. The main objective was to create this graph to have better presentation (bigger size of graph) and provide more information (Tabular, Description of graph). On the top every graph has a question mark; once user clicks that question mark, new pop-up window opens with additional information. The application is similar to National Dashboard. This application has more features in respect of national level. Some of the features like search, news, multiple dimension reports, daily, weekly, monthly reports. Few of the reports are common and available at different level like region, state, county and branch. This module represents KPI (Key Performance Indicator). The summary module page contains information for orders, revenue. The module represent comparison between different time period, status in current time frame, projected information for order or revenue against different level like national, region, state, county, territory, multi dimension report. The page shows information surrounding the employee like order, revenue. KPIs are the one of the part of this page. Through this page only user can know the number of employees hired/ fired in current month. Total number of orders newly created/ closed. Most of the information presents in graphical way. User can edit the profile of any employee. The page provides the site search functionality. The filtration criteria are city, county, contacts, file number, company, property address, and employee. The page displays the employees, agents, companies based on the criteria chosen. The page provides the WWW search functionality. This page has different real estate companies and returns latest news against the selected company by the user. This is the static page and describes the FSA Rules. This module is made for Agents. Taking advantage of this module agent can create, edit the campaign. The module is created for sales representative/ manager. The different roles are assigned to sales people. When they logged in control goes directly sales person module. The application has number of graphs to display information. The main objective was to create this graph to have better presentation (bigger size of graph) and provide more information (Tabular, Description of graph). On the top every graph has a question mark; once user clicks that question mark, new pop-up window opens with additional information. The module has four major sections like Agent, Builder, Real Estate Broker and SubDivision. Almost every place user can see the reports, Builder Module is the functional area there user can create/ Edit functionality against each sub modules. Associate sales rep/ team/ escrow closer with Real Estate Broker Company. Two dashboard applications at national and region level are created; and application is used to present the information to user based on their access permission. 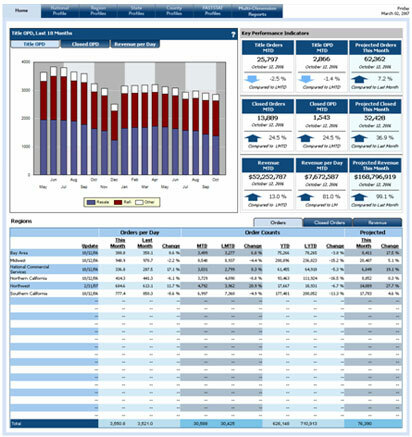 The dashboard applications are created to display the information, now question was how to manage the information/ data. STPL analyzed the needs of client and proposed the admin application that control relevant data. Following sections are proposed for admin application. The admin user can access this tool, it has the futures to create a company, add agent, associate agent with sales team/ rep or escrow closer. This tool is similar to builder module created for normal users in the region dashboard application. Database for the region decide when the user logged in. The main objective of the application is to remove the repeated entries and build the set of similar records. Currently we are using this too in the Real Estate Industries; but this tool will be helpful in the other industries where the same entity repeats number of time in different time span. And management wants to know the unique entity. The canonical tool is used to synchronize the data based on the similarity and other business logics. It creates fresh set of records. This tool is used for the Agent participate in the Real Estate Industries. The main objective of the application is to remove the repeated companies and build the set of similar companies depending on different criteria chosen. It is very helpful tool where chances of same entity repeats number of time in different time span like (hotel). Management likes to get the information of similar type of companies based on the different parameters and the records should not be repeated. The canonical tool is used to synchronize the data based on the similarity and other business logics. It creates fresh set of records. This tool is used for the Company participate in the Real Estate Industries. The page is responsible to set the access permission to each user against the page available in the region dashboard and national dashboard. This is most powerful tool of the application. Through this tool STPL tried to implement the security feature. Security is not limited to page only. This is implemented even at the section level. d. Page Elements (Table, Graphs, Info Box and KPIs etc). The team at STPL analyzed the needs and gave the solutions for them. 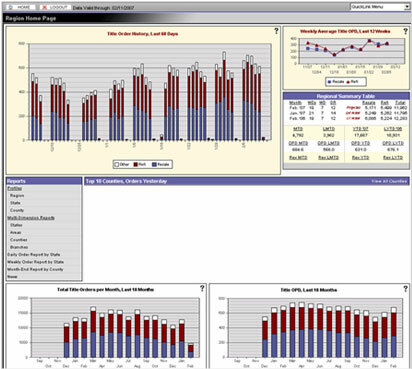 Two Dashboard applications were developed to show the information in a presentable manner at different levels and modes. Since the Client required the flexibility to the information being presented, STPL to build Admin module which helped the management to manage the data shown in two Dashboard applications. SQL Server 2005 Reporting Services is a key component of SQL Server 2005. Reporting Services was first released with SQL Server 2000 and provided customers with an enterprise-capable reporting platform with a comprehensive environment for authoring, managing, and delivering reports to the entire organization. Reporting Services in SQL Server 2005 provides additional enterprise reporting capabilities and addresses a new audience-business users who want to interact with data in an ad hoc fashion as well as create their own reports from scratch and to share them with others. In Reporting Services, the requirements of different types of users who want to interact with reports can, for the first time, be addressed with one reporting solution. Create applications that generate reports using the Report Definition Language (RDL). Create applications that embed or link to a Web browser to present and manipulate report output through URLs. 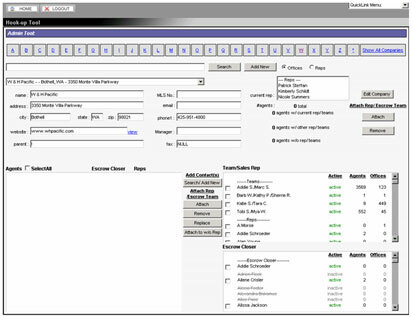 Create applications to manage one or more report servers through the Web services interface. Create additional rendering, delivery, and data processing extensions using the Microsoft .NET Framework. The functionality in Reporting Services enables developers to focus on providing business value rather than building generic reporting infrastructure in their applications. SSRS 2005 provides an option in setup to install but not configure the report server. It also provides the Reporting Services Configuration tool that lets you create a virtual directory on any Web site. SQL Server 2005 provides many new and enhanced business intelligence (BI) features designed to give you a competitive advantage. Review the following technical resources and other information designed to help you improve BI in your organization. Integrate: Easily integrate data from a wide range of operational and enterprise data sources, and gain competitive advantage through a holistic view of your business. Analyze: Gain an integrated view of all your business data as the foundation for your traditional reporting, OLAP analysis, scorecards, and data mining. Report: Deliver the information employees need to make better business decisions-in virtually any business environment. Data Mining:Explore data, discover patterns, and apply these patterns to business operations with an easy-to-use, extensible, accessible, and flexible platform. Data Warehousing: Leverage enhancements in partitioning, manageability and query optimizations to streamline operations and increase performance. The advantages include integrating multiple data sources with Integration Services; enriching data and building complex business analytics with Analysis Services; and writing, managing, and delivering rich reports with Reporting Services. Since the early days of computers, getting information from data is most vital aspect of using computer systems. As time went on the data used for extracting information grew exponentially. With the data increasing the need for data management came up as well. And this gave way to the most revolutionary development which is today known as Data Warehousing. Data warehousing is process by which we extract information from historical data. This information is very important in the aspect as it helps the management in quick decision making. The crux of benefit of using data warehousing methodology is that we extract information from large data sources that contain historical data. This information helps the management in quick decision making. Sql Server Reporting Services came as remedy for the need of presenting the data in a presentable manner as Charts. But the charts in embedded in the Reporting Services failed to full fill all the demands of the industry. As a solution for this problem Dundas Component came in the picture. The Dundas component proved to be very helpful. It increased the visualization of the charts and added few more chart options which were lacking in the Sql Server Reporting Services. Dundas component gave an edge to the visualization of the charts. It added new features to the Reporting Services which proved to be very helpful in the presentation of the charts.